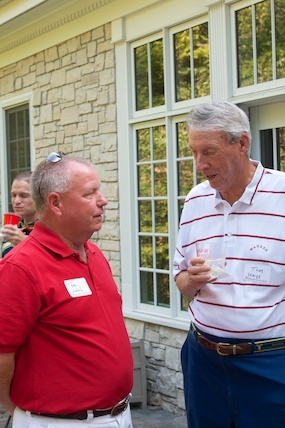 Over 60 members of the Wabash community in St. Louis - alumni, parents, students, and friends - gathered at the beautiful home of Anne and Tom Walsh '73. This event has grown every year and all attendees report having a great time. The combination of Jim Dyer's efforts to get a good turnout and Anne and Tom's superb hospitality makes this a signature event. The proof comes from the new students and their families. "This event has been a great benefit to me" reported the Mother of an incoming freshman - "everyone has been so helpful." A key element to this event is the attendance of younger alumni and current students. Incoming men will ask them things about Wabash that they just don't ask others. By the same token, older, well established alumni in the area serve as a great resource for current students and alumni as they explore post-Wabash opportunities. Many thanks to Anne and Tom Walsh!! !